MACQUOID, Percy. 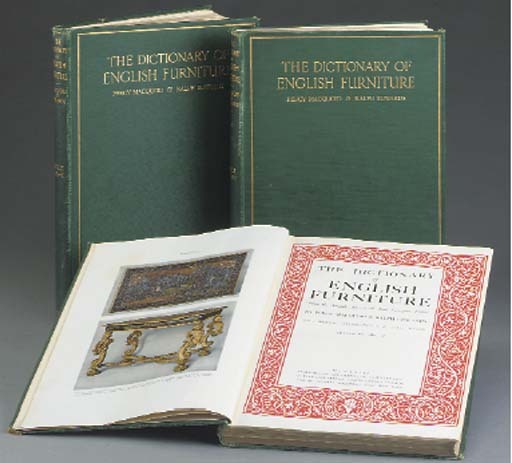 A History of English Furniture. London: T. & A. Constable for Lawrence & Bullen, 1904-1908. MACQUOID, Percy. A History of English Furniture. London: T. & A. Constable for Lawrence & Bullen, 1904-1908. 4 volumes, 4° (380 x 280mm.). Colour-printed frontispieces and plates after Shirley Slocombe, illustrations. (Some light spotting and browning.) Original red buckram gilt, top edges gilt. (Extremities lightly rubbed, a little marked, spines and outer areas of boards faded).